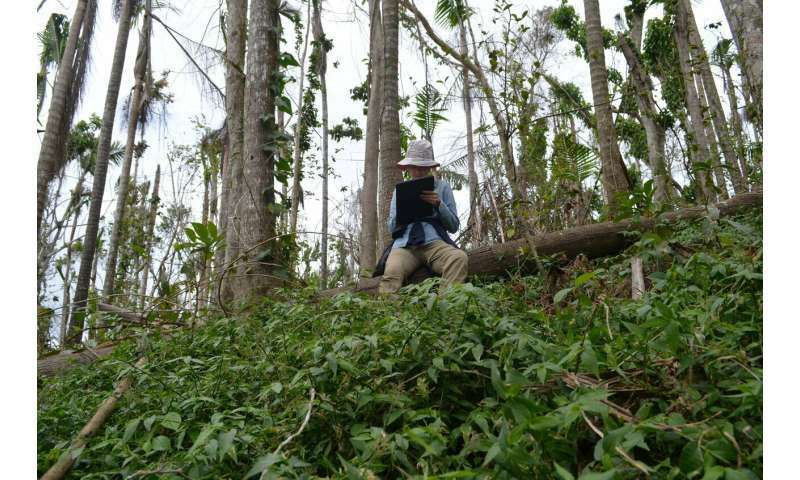 Uriarte, who has been monitoring tree growth and mortality across Puerto Rico for the past 15 years, returned soon after the hurricane and began documenting its effects. 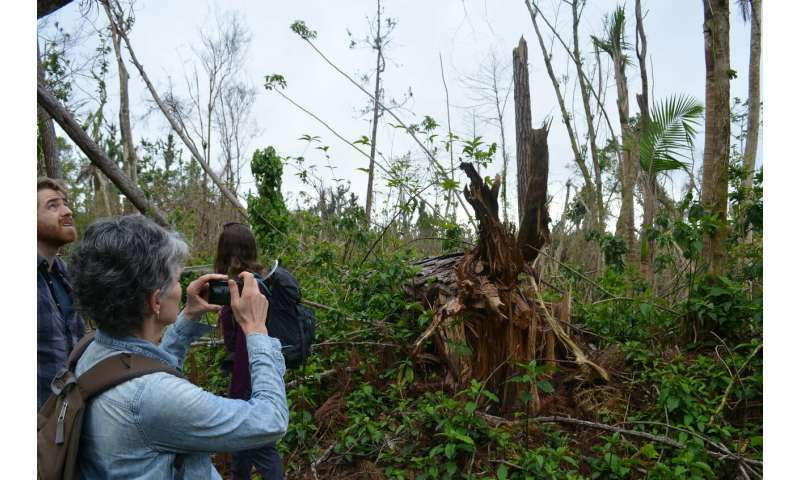 For the new study, she and two colleagues homed in on a 40-acre section of the El Yunque National Forest, near the capital of San Juan, that has been intensively monitored by multiple teams since 1990. This long-term monitoring allowed Uriarte and her colleagues to compare damage from Maria with that of past hurricanes, including 1989's Hurricane Hugo and 1998's Hurricane Georges—Category 3 storms, but the only things even close to Maria in recent times. The potential loss of many tree species could have cascading effects on forest wildlife and plants, say the researchers. This also would probably alter forests' growth dynamics, such that instead of soaking in more atmospheric carbon than they give off—which they currently do—the equation would reverse, and forests would become net emitters. This would be because the decay of felled trees would outweigh carbon taken in by any replacements. Along with palms, one species that probably would take over would be the fast-growing yagrumo, which shoots up quickly in sunny clearings created by big storms. But the yagrumo also is often the first to fall in storms, and so would just add to the problem. Thus, forests would help feed the very warming that is destroying them. 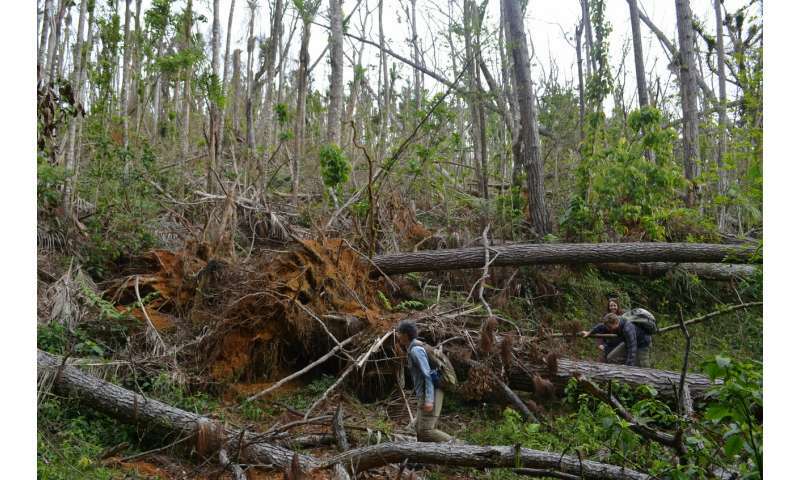 Separate estimates suggest that trees killed or damaged by Hurricane Maria alone will release about 5.75 million tons of carbon to the atmosphere, or about 2.5 percent of the carbon taken up annually by all forests in the United States.